(Nanowerk News) Graphene quantum dots created at Rice University grab onto graphene platelets like barnacles attach themselves to the hull of a boat. But these dots enhance the properties of the mothership, making them better than platinum catalysts for certain reactions within fuel cells. The Rice lab of chemist James Tour created dots known as GQDs from coal last year and have now combined these nanoscale dots with microscopic sheets of graphene, the one-atom-thick form of carbon, to create a hybrid that could greatly cut the cost of generating energy with fuel cells. 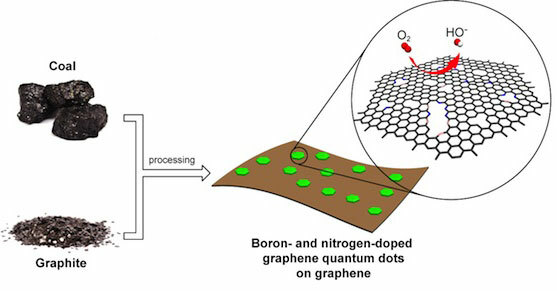 The research is the subject of a new paper in the American Chemical Society journal ACS Nano ("Boron- and Nitrogen-Doped Graphene Quantum Dots/Graphene Hybrid Nanoplatelets as Efficient Electrocatalysts for Oxygen Reduction"). The lab discovered boiling down a solution of GQDs and graphene oxide sheets (exfoliated from common graphite) combined them into self-assembling nanoscale platelets that could then be treated with nitrogen and boron. The hybrid material combined the advantages of each component: an abundance of edges where chemical reactions take place and excellent conductivity between GQDs provided by the graphene base. The boron and nitrogen collectively add more catalytically active sites to the material than either element would add alone. The Tour lab’s material outperformed commercial platinum/carbon hybrids commonly found in fuel cells. 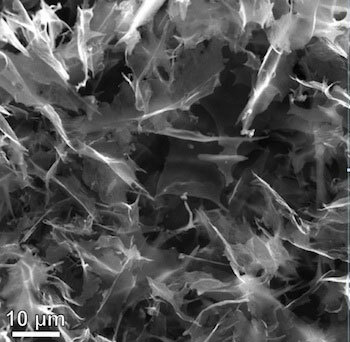 The material showed an oxygen reduction reaction of about 15 millivolts more in positive onset potential – the start of the reaction – and 70 percent larger current density than platinum-based catalysts. The materials required to make the flake-like hybrids are much cheaper, too, Tour said. “The efficiency is better than platinum in terms of oxygen reduction, permitting one to sidestep the most prohibitive hurdle in fuel-cell generation — the cost of the precious metal,” he said.